The Standard Brake Upgrade for cars originally equipped with Dunlop disc brakes offers the most economical way to transform the way your car looks, feels and stops. 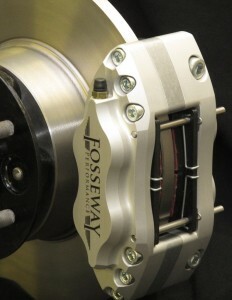 The modern caliper is designed to be used with standard brake discs to reduce cost and simplify installation. The light weight aluminium 6082 T6 billet caliper uses modern seals to give a reassuring pedal feel, offers a vastly increased brake pad area and improved wheel control by reducing your cars un-sprung weight. All our calipers are 100% compatible with your existing hydraulic system and maybe fitted without any permanent modification.